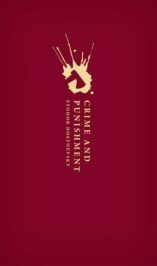 Crime and Punishment is a story of a murder and morality that draws deeply on Dostoevsky’s personal experiences as a prisoner. It contrasts criminality with conscience, nihilism with consequences, and examines the lengths to which people will go to retain a sense of liberty. One of the factors that brought all these things together was the novel’s setting, around the Haymarket in St Petersburg, where the grandeur of the imperial capital gives way to poverty, squalor, and vice. The city here is not merely a backdrop but reflects the imposition of the will of one man, its founder Peter the Great, who famously decreed its existence and oversaw its building, which cost the lives of thousands of slaves. In Notes from Underground, the narrator describes St Petersburg as ‘the most abstract and premeditated city in the whole wide world’ – again alluding to that problem of abstraction and its potential to elevate ideas over lives. In this most ideological and willed of cities, the most ideological and willed of murders seems bound to happen. Crime and Punishment embodies the spirit of St Petersburg to the extent that the character of Raskolnikov seems willed into existence by the city itself. Dostoevsky’s own dramatic life and rejection of the radical ideas of his youth led him to discover this combination. It produced a novel that still speaks to us as strongly today as it did when it was first published 150 years ago. Trace the footsteps of the characters around the city, with quotes taken from the novel, with this interactive map. Featured image credit: St Petersburg Russia by MariaShvedova. Creative Commons via Pixabay. Sarah J. Young is Senior Lecturer in Russian at the School of Slavonic and East European Studies, University College London, where she teaches and researches nineteenth- and twentieth-century Russian literature, culture and thought. She is the author of Dostoevsky's 'The Idiot' and the Ethical Foundations of Narrative (Anthem Press, 2004), and co-editor of Dostoevsky on the Threshold of Other Worlds (Bramcote Press, 2006). Excellent review, assists with building issues when discussing ideas with Russian and Odessa acquaintances. Is Russia ready for the Western idea of freedom and a type of Capitalistic system as the United States of American designates its form of government and economical basis for growth and social welfare system that has been developed?